The name Bocşa derives from the Romanian term “Bocşă” which means charcoal stack. A charcoal stack is a pile of woods which is airtightly covered in soil and then lit in order to produce charcoal. The soil around Bocşa used to be very rich in natural resources such as gold, silver and nonferrous metal. Those had been mined in the area since Roman days. The Hungarians and Turks continued the mining of metal and coal in the Banat Ore Mountains, which reached from Bocşa into the southern Danube Valley. Prince Eugene of Savoy conquered Banat in 1716 and mined the area’s copper which he needed for the production of cannons. In 1720, Austrian miners founded German Bocşa 10 kilometres upstream from Romanian Bocşa. There, the soil was still rich in resources and soon the first smelting ovens and hydraulic forges were in operation. The Ottoman Wars of 1738 and 1739 were a throwback for the economy of Bocşa. Charcoal production had reached other areas and the importance of Bocşa as an industrial site decreased when Reșița, which could be protected more easily and had higher resources, became the centre of industry. Artist and sculptor Tibor von Bottlik (1884-1974) who had studied art in Vienna, Munich and Paris, moved to Bocşa in 1927. 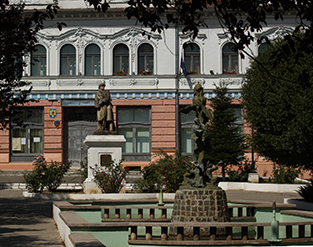 Several of his statues can be seen in Bocşa, for example on the premises of the former metal factory, in front of the school and in the local cemetery. Sculptor Constantin Lucaci was a pupil of Bottlik and is one of the city’s famous sons. 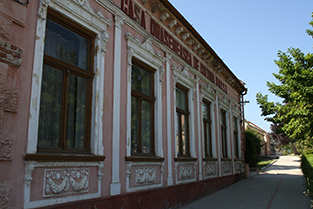 A museum which was especially built for his works displays drawings and steel statues of the metal sculptor. Today’s culture house used to be the practice of Doctor Welicsek who offered Kneip cures in the adjoining park. Older people from Bocşa still tell tales of the ladies and gentlemen whom they saw walking around in their streaming wet shirts. Dr. Welicsek and his staff encouraged their patients to walk up and down the mountain through the wet grass at the break of dawn. In order to visit the Museum Constantin Lucacis one has to get the key at the adjoining culture house. Constantin Lucacis programmatically refers to the tradition and skills of German craftsmen in the region. His exhibition “Space and Light” is an attempt at relieving the heaviness of metal in his stainless steel sculptures and thus to make the space itself weightless. Constantin Lucaci gained his worldwide reputation through his kinetic fountain. Tibor von Bottliks’ war memorial is dedicated to the victims of World War I.
Welicsek House today holds the cultural house.